As I expected, my weight was up this morning: 138.5, which is up two pounds from last week. I ate way too many almonds and Twizzlers yesterday. I had bought the individually-wrapped Twizzlers thinking that they wouldn't be a problem, since they're such a pain to open each one; yesterday, my fingers apparently got quite the workout ;) Back on track today, and I'm hoping to see 135-ish next week. Today was a much-needed rest day. I read some more of the Hansons Marathon Method book. I'm glad I bought it! I read a LOT about the program online, but the book goes way more in-depth about why the program works. I like to know the physiological reasons for running at certain paces, and going certain distances, etc. It helps me to realize the purpose for each workout. I think I'm still running my "easy" runs too fast. There are lots of charts in the book, which the nerdy part of me loves. According to the race equivalency chart, based on my most recent half-marathon time (1:52:07), I should be able to run a marathon in about 3:55. The chart is very close to having predicted my other PR's, so I guess 3:55 is a realistic goal (but I laughed out loud when I saw that). Since I'm not running to PR in Chicago, that number hasn't really meant anything in my training. Speed work: There are lots of different charts, based on what the workout is. These seem so slow to me, considering I've been doing my easy runs at roughly a 9:20/mi pace. And the McMillan Calculator gives me very different paces. But since I'm following the Hansons' training plan, I'm going to try and follow the prescribed paces for a week or two and see how I feel. I think maybe the reason my intervals were so difficult yesterday was because I was running my easy runs too fast. I just realized that today is the 10 year anniversary of the big Northeast blackout of 2003. I'm sure most people don't ever think about it, but my wedding was two days after the power went out. I remember I was working on centerpieces when the power shut off, and wasn't too worried; I thought that it would be back shortly. Then Jerry called me (he was with his best man, picking up their tuxes) and said the power was out all over the place. When we learned the extent of the blackout, I was SO upset. 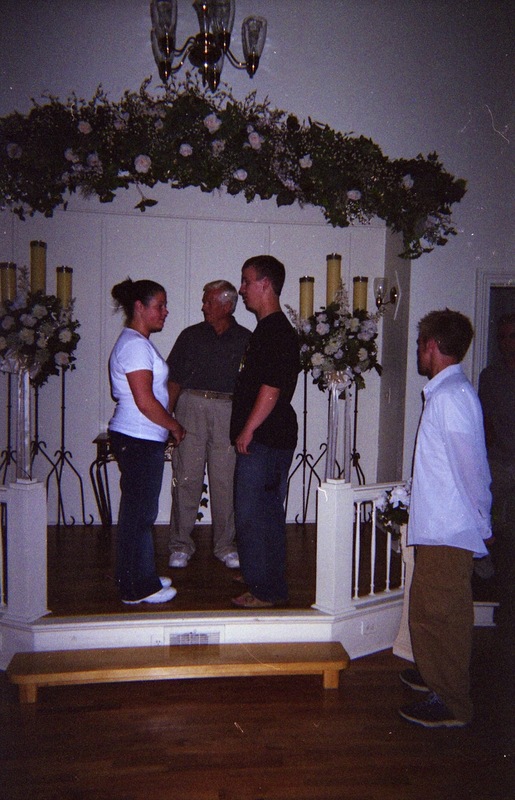 Our rehearsal and rehearsal dinner were that evening (Thursday, the 14th). Without electricity, there was no air conditioning in the chapel for our rehearsal, and it was HOT. The restaurant we'd planned to go to for the rehearsal dinner had to close because the power was out, so instead, everybody went to my parents' house and we cooked hot dogs and hamburgers on the grill (in the dark). It ended up being a lot of fun! But I cried when I woke up the next morning, and the power was still out. My photographer called. My DJ called. My caterer called. Everyone wanting to know if the wedding was still on. Everyone kept trying to make me feel better by saying that it would be beautiful to get married by candlelight, etc. I just kept thinking about a reception with no music and no food! ;) Thankfully, the power came back on late Friday night, just in time for my wedding on Saturday! So for some odd reason, August 14th is a day I always stop and think about what I was doing on this day in 2003. The Huffington Post just posted a bunch of photos from that day. It's so interesting! I can't imagine what it would be like in NYC without power like that. Jerry's and my 10th wedding anniversary is this Friday! We don't have plans, because he'll be working. But hopefully we'll be able to go out another day to celebrate. I remember freaking out about the blackout, because even though we didn't live in an affected area, we were surprising my mom with tickets to the Cleveland Indians game for the weekend for her birthday. Thankfully, everything went on as scheduled. Katie! thank you for updating your Wednesday weigh-in list! it is super inspirational that you have held the 130's ALL YEAR in a 10 pound range. thanks for a great maintenance blog and all your tips and real life ups and downs (literally) of maintaining and trying to make the weight swing window narrower. you have a summertime PR going, congrats and thank you for sharing the journey! I think I remember the blackout. I was driving on the NJ turnpike and it was free because they couldn't operate the payment booths. but they wouldn't let me keep the ticket! I'm trying Hansons too (thanks to you) and those paces are about the same as mine. Wishing I had bought the actual book instead of the kindle version with all of those charts though. I was home babysitting my 2 year old niece and when my b-i-l came to pick her up he ate with us since I had a gas stove I was still able to cook dinner. It was H.O.T. that night and we all slept in my son's room since it's always the coolest in the house. I think it lasted 16 hours for us. so you weren't heavy at that time? I had just lost about 50 lbs for the wedding. I was 160 in that pic. I put all back on, plus more, right after the wedding. I can't have Twizzlers in the house either without eating WAY TOO MANY. My 12 year anniversary is coming up on Saturday but we didn't have anything like this to contend with. Happy anniversary to you and Jerry! You should cut the power (or just turn off the lights) for the night before your anniversary every year. Nothing romantic, just dinner with candles and board games or flashlight tag. I bet it would be something your kids would always remember! That must have been one stressful wedding day--thank God the power came back on! I too gained weight after losing some the summer before I got married, and I gained it back FAST! I found this from the link on your post from today! We were also married on August 16, 2003. We were married in California and had several guests that couldn't make it from the east coast since their flights were cancelled from the black out! Ohhh, interesting to meet another "blackout bride", haha! That's unfortunate your guests from the east coast weren't able to make it. I was so grateful the power came back on before the wedding!